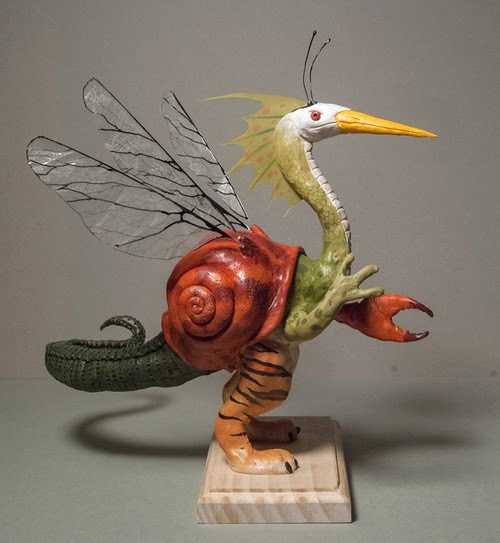 "Your 'How I Paint Dinosaurs' video inspired me to have my students create maquettes based on Edward Lear's 'Scroobious Pip' poem." "I chose Pip because they don't have to be accurate as to anatomy- they can just have fun with creating an animal character." Rick continues: “'The Scroobious Pip' is an everything animal that the other animals couldn’t quite figure out. It was part insect, part bird, part mammal, etc. So I decided to make this a three-part project; 1; the students had to read the poem and do sketches of what they think Pip would look like, 2; they would create a maquette using a wire armature and polymer clay, and 3; they would use the maquette as reference for an illustration done with watercolors and acrylics." "This is my demo so far. I plan on making this a regular project for my techniques classes. Thanks for the inspiration!" Thank you, Rick! If other teachers have used my books or videos as a starting point for classroom assignments, please send photos and a description. Read Lear's nonsense poem "The Scroobious Pip"
This is really cool. I really like the professors maquette. I hope to see the finished painting too. I also just bought your "How I Paint Dinosaurs" video download tonight. Wow! It's awesome! I did a little 20 minute sketch from a still shot from one of your maquettes. I've never drawn dinosaurs before, but I'm sure I could have never drawn anything even remotely that good without your maquette as reference. It gives you all the large masses in the correct proportions/action (assuming your maquette is sculpted well), and also gives you the information about the fall of the light, shadow shapes, etc. There's a ton of information in them that you just can't make up. It was really interesting, and I see why it's so valuable.